Trese, Cameron, and I watched a nice movie last night–“The Big Year.” It’s about three “birders” seeking to break the world record for seeing the most species of birds in one year. Today, the three of us did our own little bit of birding in our yard. We spotted two Lark Sparrows. 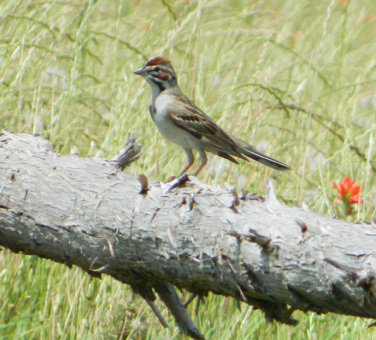 Of course, we didn’t know they were Lark Sparrows at the time. It took a field guide to help us make the identification. It’s kind of cool. Sparrows are not very pretty from a distance, but when I camera allows you to “get close” you can see the beauty in the color and design of their feathers.